"Kiloran" 9 Argyll Terrace, Tobermory, Isle of Mull. Argyll. Kiloran is a cosy end of terrace cottage in upper Tobermory, with magnificent views over Tobermory Bay and the Sound of Mull. 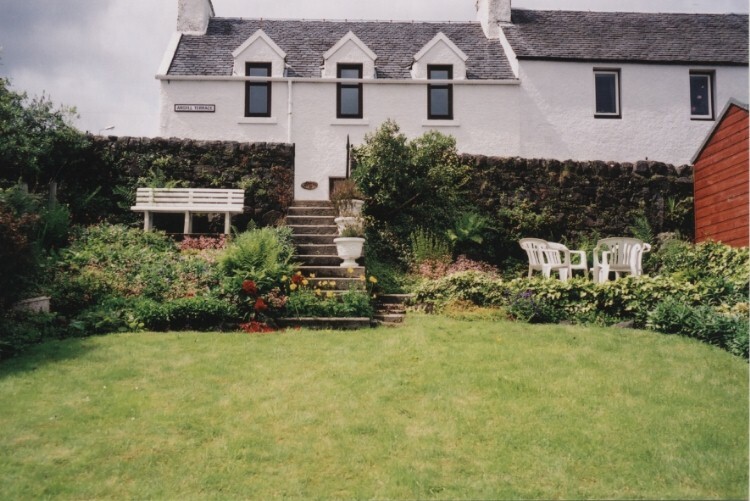 The cottage has a garden at the front overlooking Tobermory Bay and a walled garden at the rear. "Kiloran" is five minutes from the shops, post office, restaurants, launderette and boats on the waterfront. The golf course and tennis courts are approximately ten minutes walk away. Tobermory is an ideal centre for outdoor pursuits, with bird watching, fishing (sea and fresh water loch), golfing and also exploring the varied scenery of Mull with sea trips to surrounding islands. Perhaps you would rather just sit and admire the view. 10% discount for couples or for a fortnightly booking. • A 25% deposit is to be paid when booking. The balance should be paid 4 weeks before the holiday commences. • Arrivals - Entry to the cottage is after 3.30pm at the commencement of the period booked. • Departures - The cottage must be vacated by 10.00am on the morning of departure. • Bookings - Are normally from Saturday to Saturday. Linen is provided, which includes all bed linen, bath and hand towels, tea & kitchen towels. Includes electricity..
Children are very welcome but we ask that a suitable waterproof covering be provided for beds. A travel cot and high chair are available. We regret that pets are not accepted. Please make cheques payable to: Mrs J E Smithson, 8 Buchanan Road, Walsall. West Midlands. WS4 2EN.